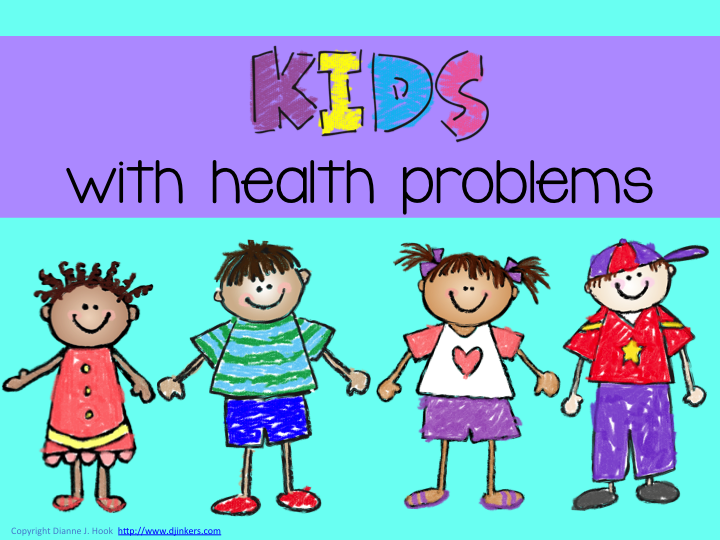 Do you have students with health problems? One of the things I have discovered from teaching in a variety of school districts, is that each district handles disseminating this information in different ways. Some schools scheduled time during the inservice days before school began to review our students’ files for information like this. Others left it up to the parents to tell the teacher. Some districts had the school nurse compile a list of all of the students in the school with health issues and gave every employee a copy. There is usually a code beside the student’s name. I.E. Amy Brown – #4, Patrick Campbell – #1, 4, Jake Diaz – #2, etc. Codes can be for things like: asthma, ADHD, nut allergy, diabetes, or other ailments. The “look at your students’ files” during in-service week disseminates the information but there are a few drawbacks to this method. Teachers have to write down pertinent information. This is a hectic time for teachers so it is easy to overlook important details that are in the files. Usually it is only the classroom teachers looking at his/her files. Yet, teachers often share recess duty and lunch duty with each other. It can create problems if teachers do not remember to tell their co-workers that they are sharing recess/lunch duty about important details like nut allergies or asthma. Depending on the parent method isn’t very efficient either. The school’s philosophy (I’m guessing) is that the medical information cards are in the nurse’s office, if a teacher has a question about a student, they know where to go to find the information. Parents often think that since they filled out the medical information card, they have done their duty of informing the school. I always tell my friends who have a child with chronic health issues to send a note/email to their child’s teacher. I think the nurse compiling a list with health codes and giving it to every employee is the best method. Think about how many different school employees come in contact with your students on a daily basis! All teachers and assistants who supervise the lunchroom should know on sight every child with a food allergy. Teachers who have recess duty and the P.E. teachers need to know which students have asthma. The list goes on and on, but you get the picture. It is also helpful to add a note to your weekly parent communication reminding parents that you would appreciate a “heads up” if their child is taking any type of medicine or having health problems that might affect them at school. You have probably had a student or two through the years with asthma. I got adult onset asthma when I turned 35. You may have heard a few tips about asthma when you’ve sat through inservices for handling medical issues in the classroom. After dealing with the side effects of my asthma medication, I now have a new outlook on my students with asthma. Did you know that if you have asthma . . .
*You can be fine one minute and in full asthma distress the next. It doesn’t happen like this every time or for every one. For some people, it is a slow decline for others it hits you quick. *Not every person will wheeze or cough. For some, they get tightness in their chest. The best way I know how to describe it is, imagine taking your husband’s belt and putting it on around your chest at the smallest notch so your chest can barely expand and contract. Then imagine wearing that all day. Try to carry your heavy tote bag or backpack when you have this tight belt on. How about running 2 laps around the gym? Any physical effort makes you sweat and causes shortness of breath. Sometimes students need to be excused from physical activities. Taking a couple of puffs of your rescue inhaler does not always fix this problem. *Asthma is worse at night. Part of the problem has to do with your lungs being flattened somewhat when you sleep. Some people sleep in a recliner when they are having a flare up to help with this. This doesn’t give you the best quality of sleep. It’s not unusual to be woken up 2-3 times a night during a flare up. Remember how tired you were when you had a newborn baby with the late night feedings? For your students with asthma and their parents the sleepless nights aren’t just a 6-8 week bleary memory. It is ongoing! These students will often come in tardy during a flareup. Can you blame them? *Each patient with asthma reacts differently to the medicines that they take. Most maintenance medicines have few side effects. What you may have noticed is a behavior change when your student is having a flare up. Suddenly, this normally well behaved child is irritable, can’t sit still, fidgets, interrupts your lesson, doesn’t finish his/her work, and has a host of other issues. I have many of the same symptoms. It feels like your are a hamster on speed. Yes, I am exhausted from the interrupted sleep, but at the same time I feel this need to do something physical because I have all of this pent up energy. I have woken up my family before at 2 a.m. because I can’t sleep. I can’t focus on doing something quiet like read a book. I usually go into cleaning frenzy when I experience this. My husband wasn’t too happy when I woke him up at 2 a.m. banging dishes as I cleaned out my kitchen cabinets. Do you have a student who has been a discipline problem lately? Do you have a student with a recent behavior change? If so, review their medical information card to see if this could be root of the problem.